As regular readers of Phillies Nation may have deduced, I am an avid fan of professional wrestling. While I attempt to limit my references to hide my fandom, every once-in-a-while, it rears its ugly head. In addition to baseball, and pro wrestling, I am also an avid game show enthusiast. I have spent more hours than I care to admit watching Richard Dawson’s Family Feud and analyzing Michael Larson‘s record breaking 1984 Press Your Luck win. One of my favorite game shows of all time, however, is Let’s Make a Deal. Baseball is viewed in a lot of ways; one of the ways the game is interpreted is as a game of chance and probability positively or negatively impacted by the skill of those who are playing it. 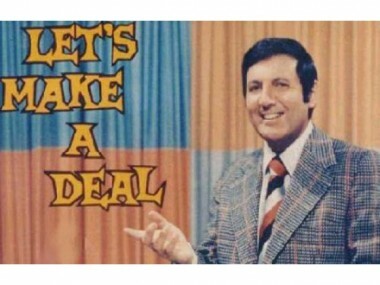 In this regard, Let’s Make a Deal does not appear to be very close to baseball; it appears to be solely a game of chance. Contestant is selected, is given a few choices, and either wins big or gets zonked. But in my opinion, Let’s Make a Deal and baseball can be summed up in the same way. Particularly in the case of the Monte Hall Paradox and the number of pitches seen. The Monte Hall Paradox has been explored by many mathematicians, scientists, and even Mythbusters. It goes like this: A contestant is offered a choice of three doors. Host Monte Hall, or now Wayne Brady, removes one of the choices that does not have the grand prize, leaving the prize between the contestant’s original choice and a new door. The host offers the contestant the opportunity to switch. Since their were three original choices, the contestant, in theory, has the same odds of wining the grand prize if he or she maintains his first selection or if they choose the other option, correct? Wrong. And in a way, Domonic Brown, sporting a career low strike-out rate of 9.2% in 76 PA since being called up, is caught in his own Monte Hall paradox and, in some cases, defying it. Why the Monte Hall problem is a paradox is simple: the instinctive answer is that the choice when there is two items is an even 50/50 split, the same odds assigned to either. But in Monte Hall’s problem, this is not true: because you are given the choice of switching your door, by switching your door, you now have 2 to 3 odds of winning the grand prize because you now have both the new door and the removed door. The answer is not immediately apparent but has been proved by mathematician after mathematician and becomes clearly when expanding the sample size. Brown’s paradox isn’t as cut and dry and, like the Monte Hall paradox, may not even seem like it is a problem. However, Brown is doing something relatively difficult and is due for some sort of change, either positive or negative, according to historic trends. At 3.96 pitches seen per plate appearance, Brown has shown high-level plate discipline since being called up. If Brown had enough plate appearances to qualify for the batting title, he would be tied for 21st in most pitches seen per plate appearance. Yet, the other 20 batters in front of Brown read like a “Who’s Who” of most-likely to strike out. In fact, of those 20, eight also appear in the list of players whose K-rates are in the top 30, with 4 of the top 5 K-raters appearing on both lists. This is nothing new to baseball. As Bill James explains, seeing more pitches is both a blessing and a curse for hitters, meaning both more walks and strikeouts, and is usually accompanied by power. Those 4 of the top 5 for K-rate who find themselves in the top 20 for pitches seen (Adam Dunn, Chris Davis, Carlos Pena, and Curtis Granderson) also rank highly among the MLB leaders in isolated power (Dunn ranks highest at 6th in the MLB). Despite seeing 3.96 pitches per at-bat, Brown is not striking out as much as anticipated, particularly when factoring in his 18.5% career rate. So what does this mean? The sample is still incredibly small but the lowered strike-out rate, which for arguments sake, would rank 6th in the MLB if Brown had enough PA to qualify for the batting title, is promising. It is incredibly unlikely Brown maintains this pace throughout the end of the season but the number of pitches Brown is seeing suggests the improvement in discipline is real. For the hitters in the top 20 of most pitches seen per PA, the entire top 11 also appears in the top 30 of the BB% rate. Brown’s MLB career BB% rate of 10.7% has been solid, and at 10.5% this year, would put him firmly at 27th in the MLB in walk rate, above likely-MVP Andrew McCutchen and on-base aficionado Alex Gordon. So where is the paradox? Brown has hit for almost no power this year, unlike most who occupy both lists, defying both the lists and Bill James’ assertions. 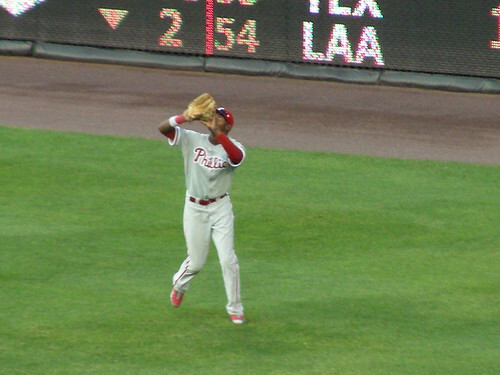 His .060 ISO would rank third-worst in the MLB, above only Ben Revere and Jamey Carroll. Caroll, who ranks 13th in pitches seen per plate appearance, is only one of six players in MLB who walks greater than 10% of the time and strikes out less than 15% of the time. Despite this feat, Carroll’s career ISO of .067 limits him, in his twilight, to a ceiling of around 1.8-2.0 fWAR a year. Thus Brown’s paradox is this: does Brown modify his approach to become more aggressive, in an attempt to hit for more power or does Brown keep on keeping on and continue to make productive outs and continue to walk? 3.) ZONK! : Brown attempts to adjust his swing again, walks go down, Ks up, and no power develops. The answer? Brown may have turned the corner and may be entering the beginning stages of accepting the Grand Prize. Brown’s approach will lead him to see many more pitches, and nearly by default, a higher number of pitches seen means the selection of pitches, in a normal sample, should improve. Instead of Monte Hall or Wayne Brady offering Brown the opportunity to switch his selection, Brown has the opportunity to walk away with both the grand prize and the runner-up prize, all while avoiding the Zonk. If you should end up on Let’s Make a Deal, however, you probably will not be so lucky. Unless, you want a YUGO full of goats, always switch once the empty door is taken away.